The reshaping so far described, of the Jewish synagogue for the purpose of Christian worship, clearly shows—as we have already said—how, even in architecture, there is both continuity and newness in the relationship of the Old Testament to the New. As a consequence, expression in space had to be given to the properly Christian act of worship, the celebration of the Eucharist, together with the ministry of the Word, which is ordered toward that celebration. Plainly, further developments became not only possible but necessary. A place set aside for Baptism had to be found. The Sacrament of Penance went through a long process of development, which resulted in changes to the form of the church building. Popular piety in its many different forms inevitably found expression in the place dedicated to divine worship. The question of sacred images had to be resolved. Church music had to be fitted into the spatial structure. We saw that the architectural canon for the liturgy of Word and sacrament is not a rigid one, though with every new development and reordering the question has to be posed: What is in harmony with the essence of the liturgy, and what detracts from it? In the very form of its places of divine worship, which we have just been considering, Christianity, speaking and thinking in a Semitic way, has laid down principles by which this question can be answered. Despite all the variations in practice that have taken place far into the second millennium, one thing has remained clear for the whole of Christendom: praying toward the east is a tradition that goes back to the beginning. Moreover, it is a fundamental expression of the Christian synthesis of cosmos and history, of being rooted in the once-for-all events of salvation history while going out to meet the Lord who is to come again. Here both the fidelity to the gift already bestowed and the dynamism of going forward are given equal expression. Modern man has little understanding of this “orientation”. Judaism and Islam, now as in the past, take it for granted that we should pray toward the central place of revelation, to the God who has revealed himself to us, in the manner and in the place in which he revealed himself. By contrast, in the Western world, an abstract way of thinking, which in a certain way is the fruit of Christian influence, has become dominant. God is spiritual, and God is everywhere: Does that not mean that prayer is not tied to a particular place or direction? Now, we can indeed pray everywhere, and God is accessible to us everywhere. This idea of the universality of God is a consequence of Christian universality, of the Christian’s looking up to God above all gods, the God who embraces the cosmos and is more intimate to us than we are to ourselves. But our knowledge of this universality is the fruit of revelation: God has shown himself to us. Only for this reason do we know him; only for this reason can we confidently pray to him everywhere. And precisely for this reason is it appropriate, now as in the past, that we should express in Christian prayer our turning to the God who has revealed himself to us. Just as God assumed a body and entered the time and space of this world, so it is appropriate to prayer—at least to communal liturgical prayer—that our speaking to God should be “incarnational”, that it should be christological, turned through the incarnate Word to the triune God. The cosmic symbol of the rising sun expresses the universality of God above all particular places and yet maintains the concreteness of divine revelation. Our praying is thus inserted into the procession of the nations to God. But what about the altar? In what direction should we pray during the Eucharistic liturgy? 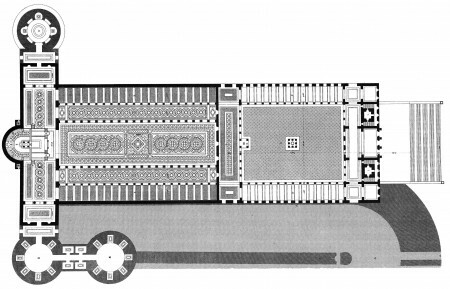 In Byzantine church buildings the structure just described was by and large retained, but in Rome a somewhat different arrangement developed. The bishop’s chair was shifted to the center of the apse, and so the altar was moved into the nave. This seems to have been the case in the Lateran basilica and in St. Mary Major’s well into the ninth century. 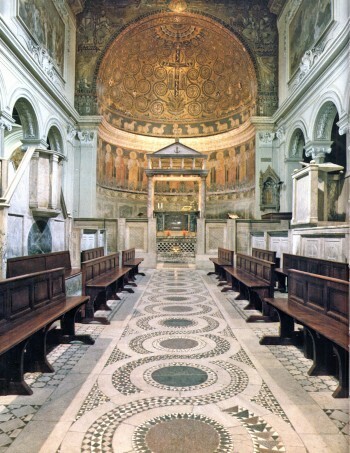 However, in St. Peter’s during the pontificate of St. Gregory the Great (590–604), the altar was moved nearer to the bishop’s chair, probably for the simple reason that he was supposed to stand as much as possible above the tomb of St. Peter. This was an outward and visible expression of the truth that we celebrate the Sacrifice of the Lord in the communion of saints, a communion spanning all times and ages. The custom of erecting an altar above the tombs of the martyrs probably goes back a long way and is an outcome of the same motivation. Throughout history the martyrs continue Christ’s self-oblation; they are like the Church’s living altar, made not of stones but of men, who have become members of the Body of Christ and thus express a new kind of cultus: sacrifice is humanity becoming love with Christ. 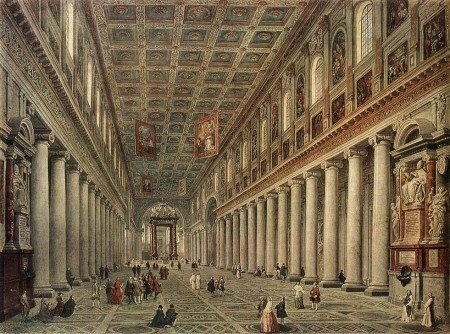 The ordering of St. Peter’s was then copied, so it would seem, in many other stational churches in Rome. For the purposes of this discussion, we do not need to go into the disputed details of this process. The controversy in our own century was triggered by another innovation. Because of topographical circumstances, it turned out that St. Peter’s faced west. Thus, if the celebrating priest wanted—as the Christian tradition of prayer demands—to face east, he had to stand behind the people and look—this is the logical conclusion—towards the people. For whatever reason it was done, one can also see this arrangement in a whole series of church buildings within St. Peter’s direct sphere of influence. The liturgical renewal in our own century took up this alleged model and developed from it a new idea for the form of the liturgy. The Eucharist—so it was said—had to be celebrated versus populum (toward the people). The altar—as can be seen in the normative model of St. Peter’s—had to be positioned in such a way that priest and people looked at each other and formed together the circle of the celebrating community. This alone—so it was said— was compatible with the meaning of the Christian liturgy, with the requirement of active participation. This alone conformed to the primordial model of the Last Supper. These arguments seemed in the end so persuasive that after the Council (which says nothing about “turning toward the people”) new altars were set up everywhere, and today celebration versus populum really does look like the characteristic fruit of Vatican II’s liturgical renewal. In fact, it is the most conspicuous consequence of a reordering that not only signifies a new external arrangement of the places dedicated to the liturgy, but also brings with it a new idea of the essence of the liturgy—the liturgy as a communal meal. This is, of course, a misunderstanding of the significance of the Roman basilica and of the positioning of its altar, and the representation of the Last Supper is also, to say the least, inaccurate. 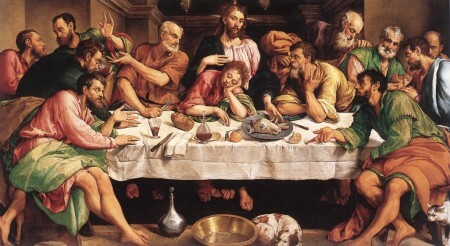 Consider, for example, what Louis Bouyer has to say on the subject: “The idea that a celebration facing the people must have been the primitive one, and that especially of the last supper, has no other foundation than a mistaken view of what a meal could be in antiquity, Christian or not. In no meal of the early Christian era, did the president of the banqueting assembly ever face the other participants. They were all sitting, or reclining, on the convex side of a C-shaped table, or of a table having approximately the shape of a horseshoe. The other side was always left empty for the service. Nowhere in Christian antiquity, could have arisen the idea of having to ‘face the people’ to preside at a meal. The communal character of a meal was emphasized just by the opposite disposition: the fact that all the participants were on the same side of the table” (pp. 53–54). In any case, there is a further point that we must add to this discussion of the “shape” of the meals: the Eucharist that Christians celebrate really cannot adequately be described by the term “meal”. True, the Lord established the new reality of Christian worship within the framework of a Jewish (Passover) meal, but it was precisely this new reality, not the meal as such, that he commanded us to repeat. Very soon the new reality was separated from its ancient context and found its proper and suitable form, a form already predetermined by the fact that the Eucharist refers back to the Cross and thus to the transformation of Temple sacrificed into worship of God that is in harmony with logos. Thus it came to pass that the synagogue liturgy of the Word, renewed and deepened in a Christian way, merged with the remembrance of Christ’s death and Resurrection to become the “Eucharist”, and precisely thus was fidelity to the command “Do this” fulfilled. This new and all-encompassing form of worship could not be derived simply from the meal but had to be defined through the interconnection of Temple and synagogue, Word and sacrament, cosmos and history. It expresses itself in the very form that we discovered in the liturgical structure of the early Churches in the world of Semitic Christianity. It also, of course, remained fundamental for Rome. Once again let me quote Bouyer: “Never, and nowhere, before that [that is, before the sixteenth century] have we any indication that any importance, or even attention, was given to whether the priest celebrated with the people before him or behind him. As Professor Cyrille Vogel has recently demonstrated it, the only thing ever insisted upon, or even mentioned, was that he should say the Eucharistic prayer, as all the other prayers, facing East. … Even when the orientation of the church enabled the celebrant to pray turned toward the people, when at the altar, we must not forget that it was not the priest alone who, then, turned East: it was the whole congregation, together with him” (pp. 55–56). Admittedly, these connections were obscured or fell into total oblivion in the church buildings and liturgical practice of the modern age. This is the only explanation for the fact that the common direction of prayer of priest and people were labeled as “celebrating toward the wall” or “turning your back on the people” and came to seem absurd and totally unacceptable. And this alone explains why the meal—even in modern pictures—became the normative idea of liturgical celebration for Christians. In reality what happened was that an unprecedented clericalization came on the scene. Now the priest—the “presider”, as they now prefer to call him—becomes the real point of reference for the whole liturgy. Everything depends on him. We have to see him, to respond to him, to be involved in what he is doing. His creativity sustains the whole thing. Not surprisingly, people try to reduce this newly created role by assigning all kinds of liturgical functions to different individuals and entrusting the “creative” planning of the liturgy to groups of people who like to, and are supposed to, “make their own contribution”. Less and less is God in the picture. More and more important is what is done by the human beings who meet here and do not like to subject themselves to a “pre-determined pattern”. The turning of the priest toward the people has turned the community into a self-enclosed circle. In its outward form, it no longer opens out on what lies ahead and above, but is closed in on itself. The common turning toward the east was not a “celebration toward the wall”; it did not mean that the priest “had his back to the people”: the priest himself was not regarded as so important. For just as the congregation in the synagogue looked together toward Jerusalem, so in the Christian liturgy the congregation looked together “toward the Lord”. As one of the fathers of Vatican II’s Constitution on the Liturgy, J. A. Jungmann, put it, it was much more a question of priest and people facing in the same direction, knowing that together they were in a procession toward the Lord. They did not close themselves into a circle; they did not gaze at one another; but as the pilgrim People of God they set off for the Oriens, for the Christ who comes to meet us. But is this not all romanticism and nostalgia for the past? Can the original form of Christian prayer still say something to us today, or should we try to find our own form, a form for our own times? Of course, we cannot simply replicate the past. Every age must discover and express the essence of the liturgy anew. The point is to discover this essence amid all the changing appearances. It would surely be a mistake to reject all the reforms of our century wholesale. When the altar was very remote from the faithful, it was right to move it back to the people. In cathedrals this made it possible to recover the tradition of having the altar at the crossing, the meeting point of the nave and the presbyterium. It was also important clearly to distinguish the place for the Liturgy of the Word from the place for the properly Eucharistic liturgy. For the Liturgy of the Word is about speaking and responding, and so a face-to-face exchange between proclaimer and hearer does make sense. In the psalm the hearer internalizes what he has heard, takes it into himself, and transforms it into prayer, so that it becomes a response. On the other hand, a common turning to the east during the Eucharistic Prayer remains essential. This is not a case of something accidental, but of what is essential. Looking at the priest has no importance. What matters is looking together at the Lord. It is not now a question of dialogue but of common worship, of setting off toward the One who is to come. What corresponds with the reality of what is happening is not the closed circle but the common movement forward, expressed in a common direction for prayer. Häussling has leveled several objections at these ideas of mine, which I have presented before. The first I have just touched on. These ideas are alleged to be a romanticism for the old ways, a misguided longing for the past. It is said to be odd that I should speak only of Christian antiquity and pass over the succeeding centuries. Coming as it does from a liturgical scholar, this objection is quite remarkable. As I see it, the problem with a large part of modern liturgiology is that it tends to recognize only antiquity as a source, and therefore normative, and to regard everything developed later, in the Middle Ages and through the Council of Trent, as decadent. And so one ends up with dubious reconstructions of the most ancient practice, fluctuating criteria, and never-ending suggestions for reform, which lead ultimately to the disintegration of the liturgy that has evolved in a living way. On the other hand, it is important and necessary to see that we cannot take as our norm the ancient in itself and as such, nor must we automatically write off later developments as alien to the original form of the liturgy. There can be a thoroughly living kind of development in which a seed at the origin of something ripens and bears fruit. We shall have to come back to this idea in a moment. But in our case, as we have said, what is at issue is not a romantic escape into antiquity, but a rediscovery of something essential, in which Christian liturgy expresses its permanent orientation. Of course, Häussling thinks that turning to the east, toward the rising sun, is something that nowadays we just cannot bring into the liturgy. Is that really the case? Are we not interested in the cosmos anymore? Are we today really hopelessly huddled in our own little circle? Is it not important, precisely today, to pray with the whole of creation? Is it not important, precisely today, to find room for the dimension of the future, again, indeed to live, the dynamism of the new creation as an essential form of the liturgy? Another objection is that we do not need to look toward the east, toward the crucifix—that, when priest and faithful look at one another, they are looking at the image of God in man, and so facing one another is the right direction for prayer. I find it hard to believe that the famous critic thought this was a serious argument. For we do not see the image of God in man in such a simplistic way. The “Image of God” in man is not, of course, something that we can photograph or see with a merely photographic kind of perception. We can indeed see it, but only with the new seeing of faith. We can see it, just as we can see the goodness in man, his honesty, interior truth, humility, love—everything, in fact, that gives him a certain likeness to God. But if we are to do this, we must learn a new kind of seeing, and that is what the Eucharist is for. A more important objection is of the practical order. Ought we really to be rearranging everything all over again? Nothing is more harmful to the liturgy than a constant activism, even if it seems to be for the sake of genuine renewal. I see a solution in a suggestion that comes from the insights of Erik Peterson. Facing east, as we heard, was linked with the “sign of the Son of Man”, with the Cross, which announces the Lord’s Second Coming. That is why very early on the east was linked with the sign of the Cross. Where a direct common turning toward the east is not possible, the cross can serve as the interior “east” of faith. It should stand in the middle of the altar and be the common point of focus for both priest and praying community. In this way we obey the ancient call to prayer: “Conversi ad Dominum”, Turn toward the Lord! In this way we look together at the One whose death tore the veil of The Temple—the One who stands before the Father for us and encloses us in his arms in order to make us the new and living Temple. Moving the altar cross to the side to give an uninterrupted view of the priest is something I regard as one of the truly absurd phenomena of recent decades. Is the cross disruptive during Mass? Is the priest more important than the Lord? This mistake should be corrected as quickly as possible; it can be done without further rebuilding. The Lord is the point of reference. He is the rising sun of history. That is why there could be a cross of the Passion, which represents the suffering Lord who for us let his side be pierced, from which flowed blood and water (Eucharist and Baptism), as well as a cross of triumph, which expresses the idea of the Second Coming and guides our eyes toward it. For it is always the one Lord: Christ yesterday, today, and forever (Heb 13:8). This article can be found as Part II, Chapter 3 of Pope Benedict XVI’s book The Spirit of the Liturgy, available from Ignatius Press.